For the wider application of artificial intelligence to automobiles, see Vehicular automation. 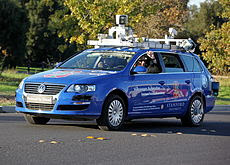 Junior, a robotic Volkswagen Passatparked at Stanford University in 2009. An autonomous car, also known as a personal automated vehicle, or informally as a robotic car or self-driving car, is a motor vehicle capable of automated driving and navigating entirely without direct human input. As defined here, automated vehicles exist mostly as prototypes as of 2013, but they are likely to be commercialised in the near future. Automated vehicles sense their surroundings with such techniques as radar, lidar, GPS and computer vision. Advanced control systems interpret sensory information to identify appropriate navigation paths, as well as obstacles and relevant signage. Some automated vehicles can furthermore update their maps based on sensory input, allowing them to navigate through uncharted environments. Since the late 2000s, significant advances have been made in both technology and legislation relevant to autonomous cars. Numerous major companies and research organizations have developed working prototype automated vehicles, including Google, Continental Automotive Systems, Nissan, Toyota, Audi and Oxford University. In June 2011, the state of Nevada was the first jurisdiction in the United States to pass a law concerning the operation of autonomous cars. The Nevada law went into effect on March 1, 2012, and the Nevada Department of Motor Vehicles issued the first license for a self-driving car in May 2012. As of February 2013, three U.S. states have passed laws permitting driverless cars: Nevada, Florida and California.